We’re still clamming and we’re discovering that it’s a lot like a treasure hunt. You can’t predict what you will dig up. Our last haul consisted of large “chowda” clams. Since we’ve already made stuffed clams, clam chowder and Portuguese clam stew, it was time to get creative. Since last October I’ve been making homemade pizza about once a week. As much as I love it, I get bored making anything the same every time. That has led to a whole bunch of fun experiments and I have yet to regret a single one, but the clam pizza ranks as one of my favorites. I used the dough recipe I wrote about here. I steamed the clams, just until they opened and then removed them from the shells, chopped them and rinsed them in a colander to remove any stray sand. After I rolled out the dough, I gave it a drizzle of olive oil and then spread the chopped steamed clams on the dough. I wanted to keep them under the cheese so they wouldn’t dry out and it worked perfectly. 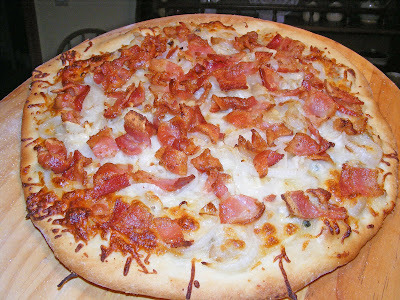 Then I topped it with cheese, some caramelized onions and garlic and chopped bacon. Totally delicious! In other news, we’ve been busy tending our garden and building a chicken condo in our back yard. This project seems to become more complex with each pounded nail (meaning it still isn’t done and those chicklets are still living in my basement). But the Kitchen Genius did build them a mobile poultry run and now they spend their days outside. We love to just sit and watch them (even the teenagers!) It’s so darned peaceful. Until it isn’t! We’ve had our first run in with a predator and it wasn’t a raccoon, fox, coyote, skunk or hawk like I feared. Instead it was our backyard neighbor’s dog, a little tan colored bat out of hell that made a bee-line for our chickens and went berserk, barking and trying to dig a hole under the pen to get in. Poor little Tinkerbell got a cut on her comb that actually bled! Luckily our daughter Julie was home and scared the crazy dog away. I’m not a “call the police on your neighbor kind of gal,” but I was so upset (and worried about a repeat attack) that I called the animal control officer. She gave the neighbors a reminder that there is a leash law in our town and informed them about the chicken incident. For some reason, this attack shocked me. The chickens have been living in our house for a month and our dog and cat have almost completely ignored them. They are in an enclosed pen and I’m not sure what they think is going on down in the basement, but they haven’t been curious enough to check it out. Now that the chickens spend their days outside, our cat (and the other neighborhood felines) seem slightly fascinated but mostly terrified of the chickens. Our Daisy literally hides behind a tree when she watches them and she hasn’t gotten closer than 20 feet - ever. They actually get bigger EVERY day, and here they were going through an awkward stage with spiked new feathers. It must be time to get out there with my camera and capture their new sleek feathered look. Ooh! 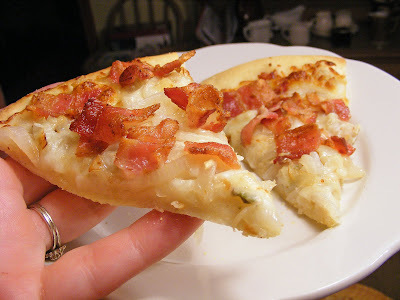 I love that pizza idea... pizza meets clams casino... love love love! the babies are outside! yes! they love to dig and scratch at the earth, so it's good that you let them out (they need that). is the dog still coming around? all the more reason for the "fort knox" fence! Clam pizza is so creative!! The little chicks are so big!! It must be fun watching them grow. Mean old dog. I'm enjoying watching your chickies :) I grew up in New England and absolutely love clams... delish! funny. I just posted about chickens! Love the pizza with the clams...never ever tried such a combo before, but my mouth is watering! What a fun pizza! Love the chicks! The clam pizza has my mouth watering - why haven't I ever thought of that? Great post.